Tired of cooking tofu that tastes like blah? Meet the best cooked tofu recipe. I’ve found this to be my go-to, reliable, and trustworthy tofu recipe that I can always count on making on meal prep day and inevitably will enjoy later in the week. If you’re looking for a tofu recipe that goes with everything you add it to — from salads, a stir-fry, roasted vegetables, dipped in a sauce or condiment, added to pasta, or your favorite Nourish Bowl — then you’ve found it here! 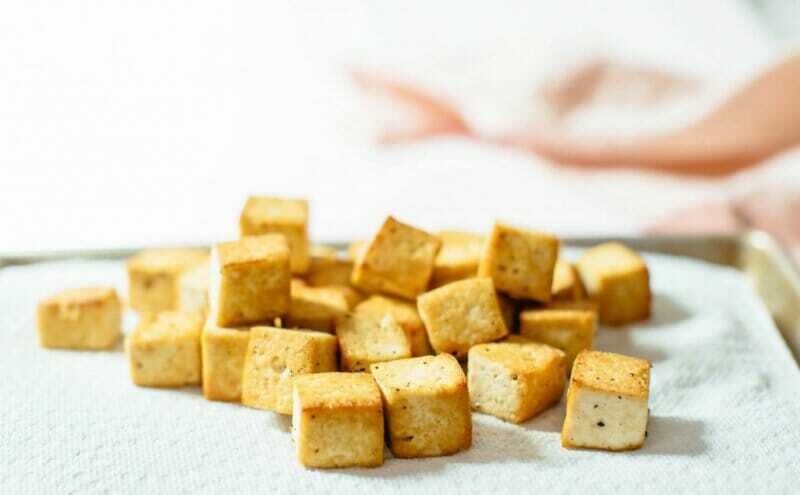 This best cooked tofu recipe is a mix of sweet, spicy, and savory from the nutritional yeast (hello B vitamins and protein), soy sauce of your choice, a splash of maple syrup, an optional dash of chili sauce, and spices you probably already have in your pantry. The soybean is one of the most common foods in our diet, primarily because soy is found in most processed foods (1). Tofu is made from soy and depending on the brand you can purchase tofu that’s organic and/or organic and sprouted. Sprouted means the soybeans have been sprouted before being processed as tofu, which may help increase the nutrient density. Take a deeper look at the health benefits of soy and some things to consider when consuming soy in our NS Society exclusive journal article. You can make a large batch of this recipe for multiple servings for the week ahead and if you want to use this sauce on other proteins like tempeh, fish, chicken, etc. then you absolutely can and it’ll taste great! It’s one of the strongest, most animal-like protein in terms of chemical makeup. Some research says that soy has a high concentration of BCAAs or branched-chain amino acids, which are beneficial to athletic performance (5).